Home Sponsorship M.A.R.S. 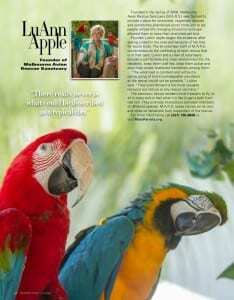 is in Space Coast Living Magazine. Unfortunately as my computer skills are limited I can only hope this link takes you to the magazines site. I can honestly say this article was something we had hoped would happen for a very long time. M.A.R.S. As you all know by now is the short version for Melbourne Avian Rescue Sanctuary our exotic bird rescue located on Florida’s Space Coast. We are always seeking ways to get the word out of our organization but lack the funds to promote all the work we do and programs we offer here at the rescue. Having a page featured in a magazine such as Space Coast Living will certainly aide us in reaching a far larger audience and we so thank them for this chance to do so. As those that follow our Facebook page know this article is also a bit bittersweet as it is the last photos taken of our beautiful Blue and Gold Macaw Woody and her life long partner Paco. Woody passed away shortly after these photos were taken. As always all here at our Florida Parrot Rescue MARS want to thank all of you for your continued support of our cause and for reading this posting.